Habaki : silver Gassan habaki. Blade length : 67.4　cm or 26.53 inches. Sori :2.6cm or 1.02 inches. Era : Showa 14, August. 1939.
with deep sori and long Kissaki nice looking shape. Jigane :Koitame hada well grained with jinie attach. Hamon :Nie deck gunome midair with many ash consist of deep nioikuchi and soft Habuchi. In Hamon, there are sunagashi and Kinsuji scatter. Boshi is round shape with deep nioikuchi and hakikake style. There are some Yaki on the sinigiji. Special feature: Gassan Sadakatsu was born as the second son of the First Gassan Sadakazu in 1869. Sadakatsu was a representative swordsmith of Taisho to early Showa period. 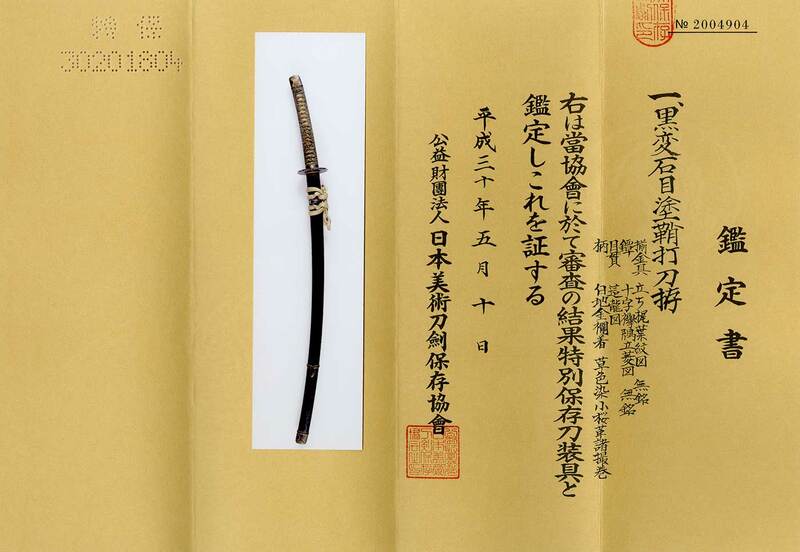 the tradition that has been continued from the Kamakura period still lives on in gendai swordsmiths. were designated as preservers of Important Intangible Cultural Assets, popularly known as Living National Treasures. Sadakatsu passed away in 1943, aged 74. Koshirae : NBTHK Tokubetsu Hozon To-So-Gu. Saya :On the black roar saya, many kawarinuri mixed up unusual saya. with gold and silver color. Menuki : dragon is engraved by solid gold? or gold color. August,Gassan Sadakatsu made special god sword for this shrine. in the field of the Ishikiri temple. The Koshirae is also high qualitywhich is very good condition. with NBHK Tokubetsu Hozon Token and Tokubetsu hozon To-SoGu. I recommend this sword high quality and also quite rear important sword for you. 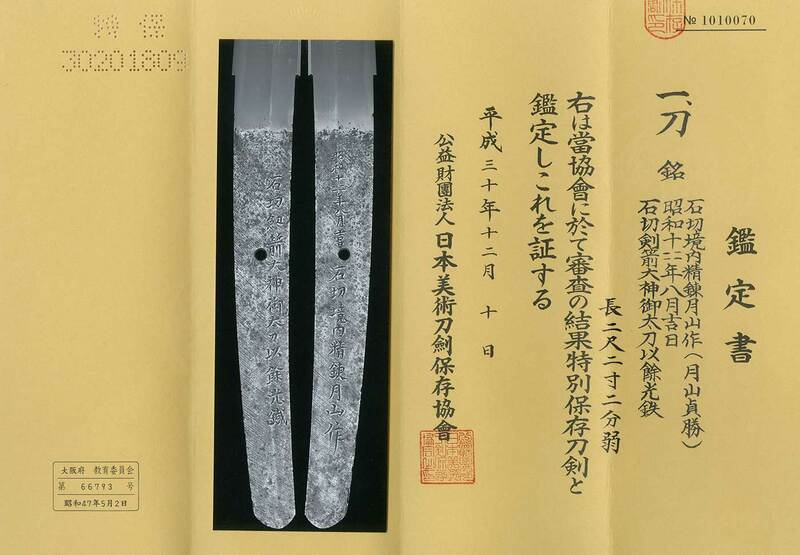 NBTHK Tokubetsu Hozon paper for the blade and Koshriae.